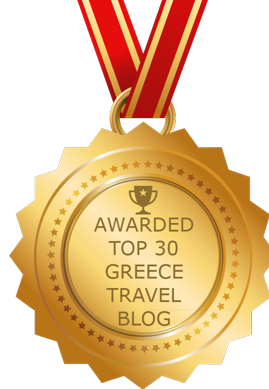 … and superb Greek cuisine served at restaurants like O Xamos!, it’s easy to understand why travel blogger Dace was drawn to Milos two years in a row. (All of the photos in this post are by Dace and originally appeared on her website, Dace Travels. They are reposted here with her kind permission). Well worth repeating: My regular readers know how much I enjoy Milos — I’ve published numerous posts about the island in the last several years, along with dozens of photographs we shot during two separate visits. I’m always keen to hear and read what other travellers think of it, in particular to see if they had similarly delightful experiences (the feedback has been overwhelmingly laudatory, I’m happy to report). I also like to hear people’s impressions of places they managed to see in parts of Milos we haven’t yet explored ourselves since it gives us ideas about new places to check out next time we go back. So when I discovered a Milos trip report link in a post on the TripAdvisor Milos forum, I was excited to read what the writer had to say, and to view her holiday photos. Clicking on the link actually was a double treat because it took me to not one but two separate trip reports for Milos, posted by Latvian writer Dace on her personal blog, Dace Travels. 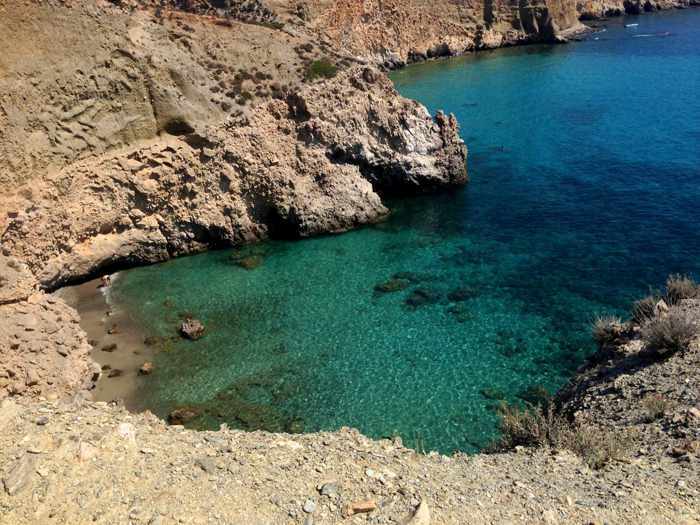 In her first post, Greece: The beauty of Milos, Dace explains that she chose Milos after reading about it on a “hidden gem” list for Greece. “What a great choice it was!,” she wrote. “The island has 70 different beaches, it’s not overcrowded by tourists; the western part is more wild while the eastern part is more developed. We spent 6 days there but it was not enough.” But in those six days, she saw a variety of places I’ve only read about in online travel guides — Thiafes beach, Tria Pighadia, Kolymbissionas, Amoudaraki and Manddrakia. Once more, Dace posted lots of beautiful photos and descriptions of even more amazing places I haven’t seen, leaving me feeling a strong tinge of envy. 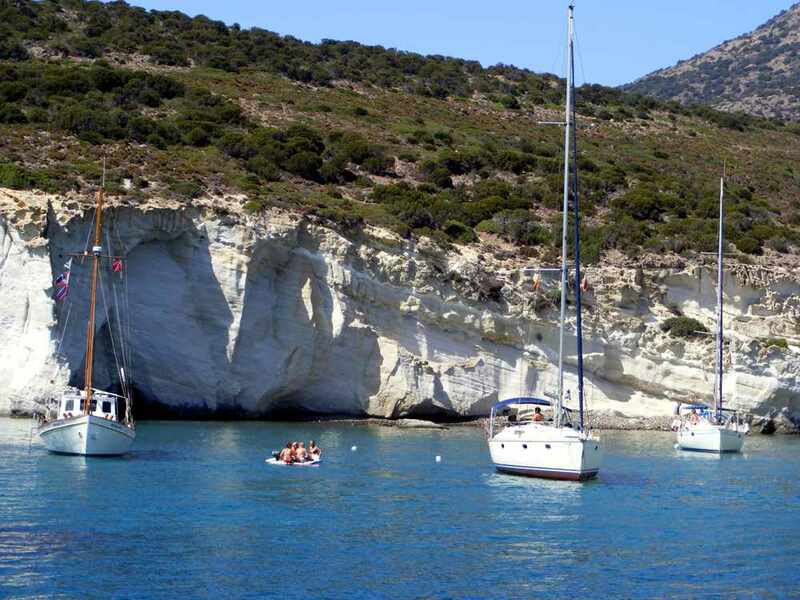 Those spots included Cape Vani, Voudia Bay, Pollonia, and a slew of splendid beaches — Angathia, Agios Ioannis, Triades, Firiplaka, Paleochori, Plateina, Agio Kyriaki and Tsigrado. Both reports are fascinating and fun to read. Dace has a great sense of humour, so I chuckled at some of her stories (like the “quad people” they encountered at some beaches) and cringed at another (her account of a stomach-churning ferry ride to Milos). And of course there’s dozens of photos of stunning Milos scenery that are bound to make you dream about going there yourself. 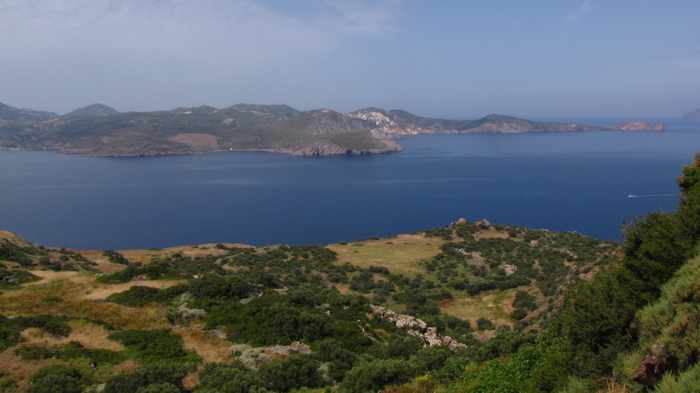 Scenic viewpoints: Several readers recently asked about places to stay or visit on Milos to enjoy amazing views and scenery. On our last trip to the island we stayed at Halara Studios in Plaka village, where we had inspiring views of the Bay of Milos from our windows and from the long terrace outside our room. 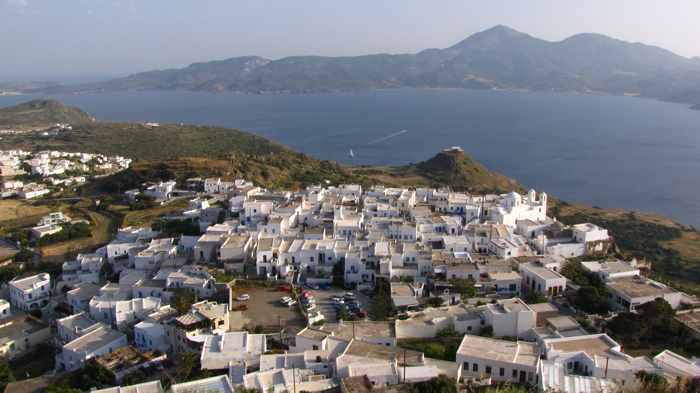 (Plaka is the capital of Milos island.) Another option for accommodations is Studios Betty, about which I’ve heard good comments. 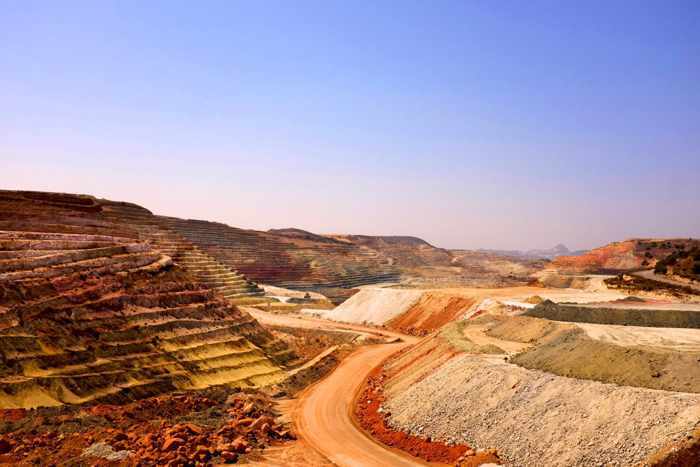 It’s located only a few meters from Halara, and offers substantially similar views. 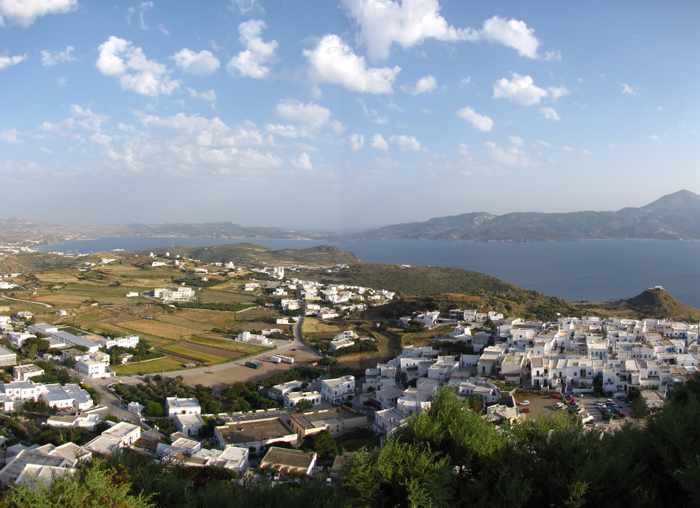 Below are several pics showing some of the Bay of Milos views from Halara Studios, Plaka and Kastro. You can view additional photos in the Milos 2011 photo collection on the MyGreeceTravelBlog Flickr page. 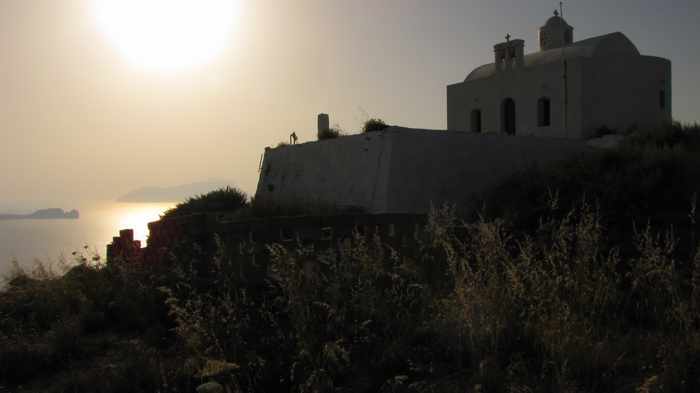 Take a look, in particular, at the Halara Studios, Plaka village and Kastro at Sunset albums. Also visit the Plaka Milos Facebook page for more photos and information. 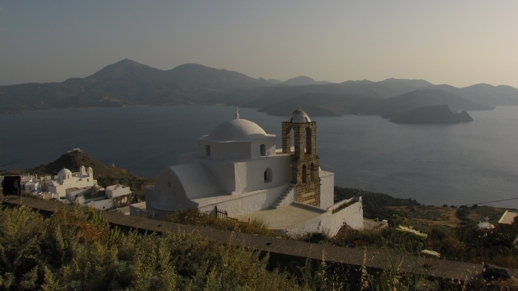 Thalassitra church sits roughly halfway up the mountain peak between Plaka and Kastro. 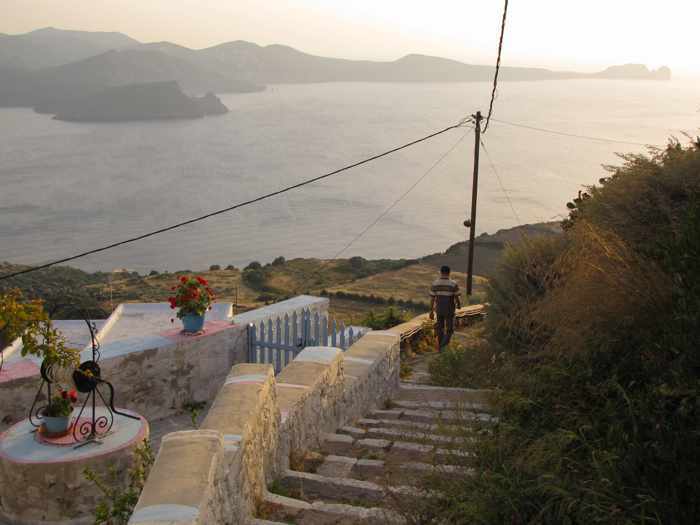 Its terrace is an excellent place to view the sunset if you can’t make it all the way up to Kastro. 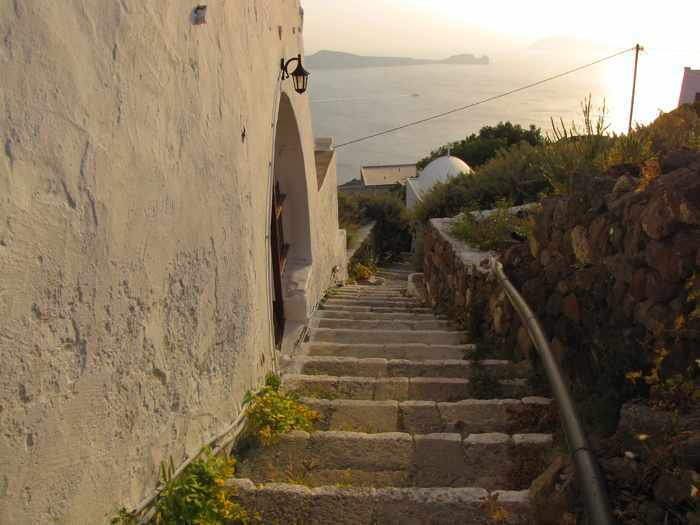 Looking down some of the steps on the mountainside below Kastro. At left is the Thalassitra church. Fashion model Vasilianna strikes a pose on one of the seaside rock formations at spectacular Sarakiniko beach on Milos island in the Cyclades. The photo, by Olympia Krasagaki, graces the cover of the summer 2014 edition of Blue, the in-flight magazine of Aegean Airlines. Cover story: One of my favourite islands will be getting a lot of international attention over the next three months thanks to Aegean Airlines. 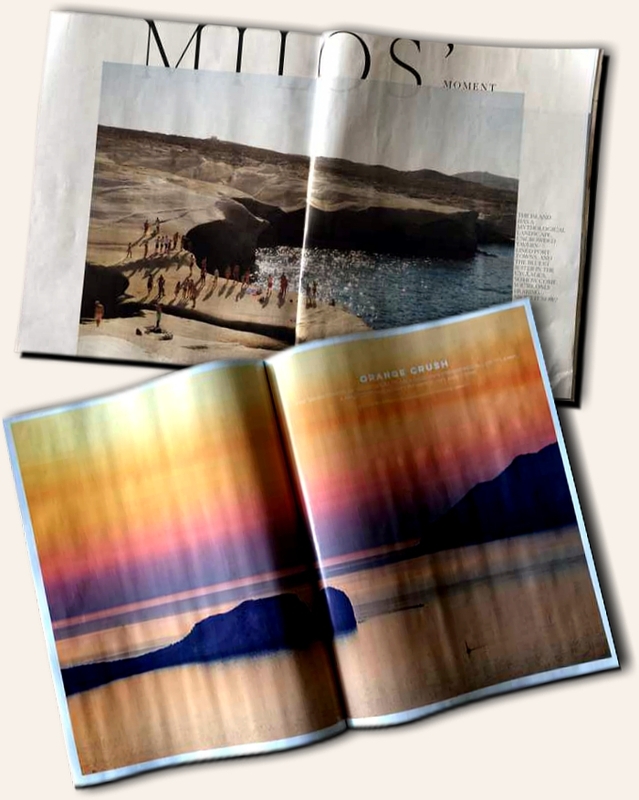 Milos is pictured not only on the cover of the airline’s in-flight magazine Blue this summer, but also in a Nature focus article as well as in a fashion photo spread featuring some of the island’s breathtaking beaches and magnificent coastal scenery. 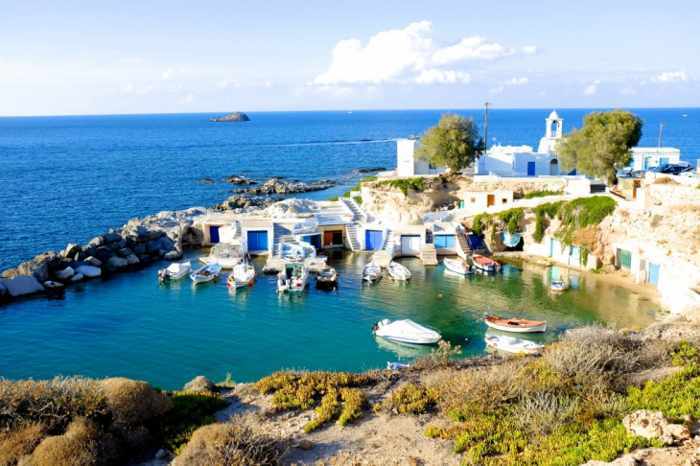 Milos is, of course, one of the splendid island destinations that can easily be reached from Athens on daily flights by Olympic Air, which merged with Aegean several years ago. The release of the summer 2014 edition of Blue was announced today on the Aegean Airlines International Facebook page. The 340-page glossy magazine will be available to passengers flying Aegean during the next three months, and also can be viewed online in an e-book format available on the airline’s website. Click here to peruse the online edition. The magazine cover photo shows a fashion model posing on the seaside at Sarakiniko, which is one of the most fascinating and impressive coastal landscapes I’ve seen out of all the Greek islands I’ve been fortunate to visit so far. More pictures of Sarakiniko are included in a women’s fashion feature that starts on page 212. The fashion spread includes photos shot at other spectacular locations on Milos, including the colourful fishing village at Klima, the picturesque mountain town of Plaka, the scenic seaside at Fyriplaka beach, and the Glaronissia islets off the north coast of the island near Pollonia. The coastline at Fyriplaka beach provides a breathtakingly beautiful backdrop for this fashion photo by Olympia Krasagaki. 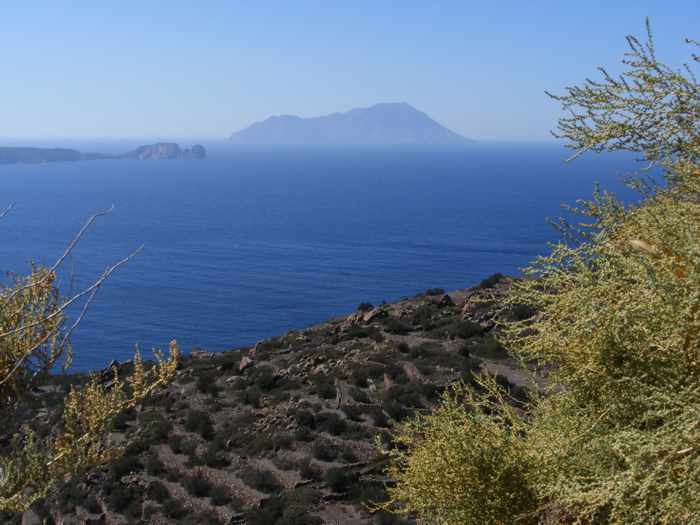 Click here to open the online edition of Blue magazine and view full-size photos of the superlative Milos scenery. 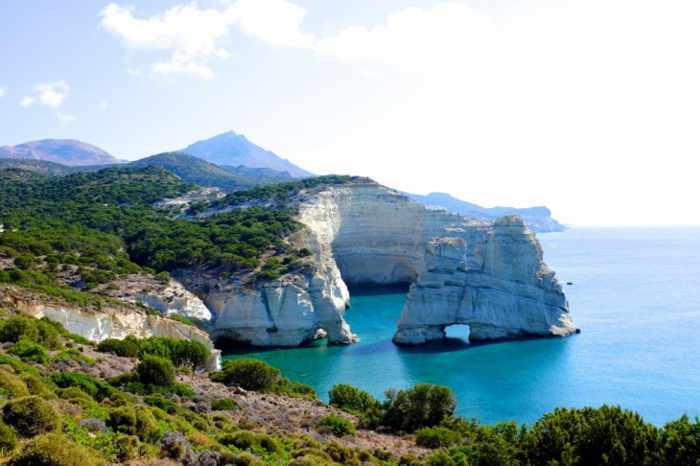 The Nature focus Milos: natural wonder begins at page 116 and includes amazing photos of the majestic coastal rock formations at Kleftiko and the incomparable Papafragas, a sliver of sandy beach wedged between tall stone walls. The article describes popular tourist and natural attractions on Milos, including some of the island’s 75 remarkable beaches, and suggests places to eat and drink. 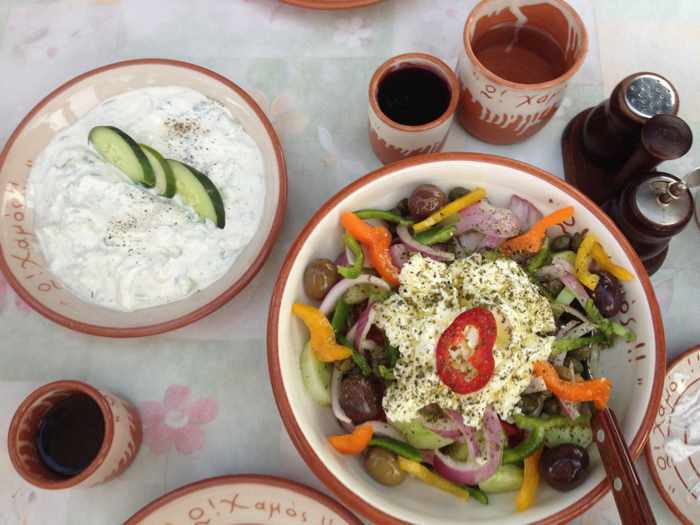 Restaurant recommendations include our personal favourite O Chamos at Papakinou beach in the port town of Adamas, as well as Archontoula and Fatses in Plaka, Ergina in Tripiti, Enalion in Pollonia, and a few others. For nice spots to enjoy a drink, the magazine’s picks include Akri and Mikro in Adamas, along with Gatis, Bakaliko and Utopia Café in Plaka (see my April 4 2012 post Utopian sunsets on Milos for photos of the sensational sunset views from the terrace at Utopia Café’s outdoor terrace). Although Milos claimed bragging rights to the cover photo and two feature articles, it isn’t the only must-see Greek destination profiled in Blue magazine. The summer issue is packed with beguiling photos and interesting travel information about 17 other intriguing islands as well as several cities and regions on the mainland. For foodies, there are appetizing descriptions of new restaurants that have opened recently on the islands of Rhodes and Mykonos, as well as in Halkidiki. 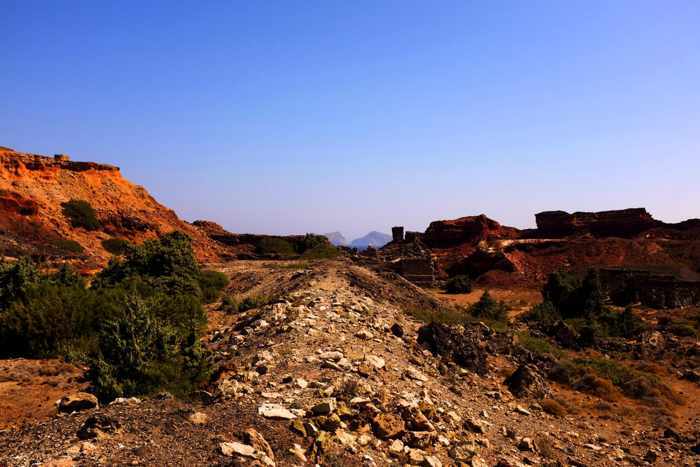 For fans of arts and culture, there are articles about the 2014 Sani Festival in Halkidi, plus the impressive Viannos Art Gallery in Keratokambos, a small town situated at the southernmost point on Crete. And for travellers who’d like to plan some island hopping, there are informative reports on things to see and do on Syros, Kasos, Paros, Corfu, Kos, Leros, Naxos, Lemnos, Ikaria, Kastellorizo, Kefalonia, Santorini, Rhodes and Astipalia — all accompanied by captivating full-colour photos. 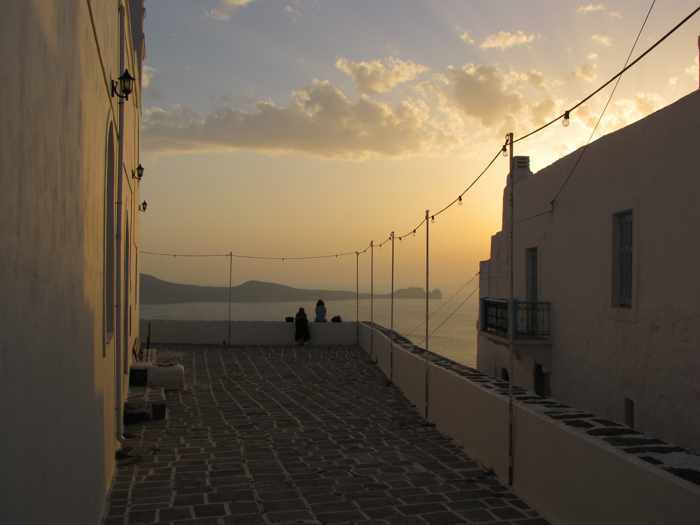 If you haven’t been to Milos and want to see why it was an outstanding choice for Blue magazine’s cover, check out my Milos photo collection on Flickr. It includes images of Milos landmarks like Thalassitra Church at Plaka village (above).